Today we want to take a look on a company that is in the retail business, which is normally a place where the competition between the several players really hard. We are talking about the Hornbach Baumarkt AG, one of Europe’s leading and Germany’s second biggest DIY-Stores operator. DIY stands for the Do-It-Yourself Industry. But where does the high competition come from? If you take a closer look at the DIY Industry in Germany, you will clearly see that you can find nearly always two or more DIY stores next to each other, and that is the case in nearly every bigger city in Germany. Until a few weeks ago there were 4 big competitors in the German market which have a market share greater than 10% each and furthermore there are numerous other players in the market. 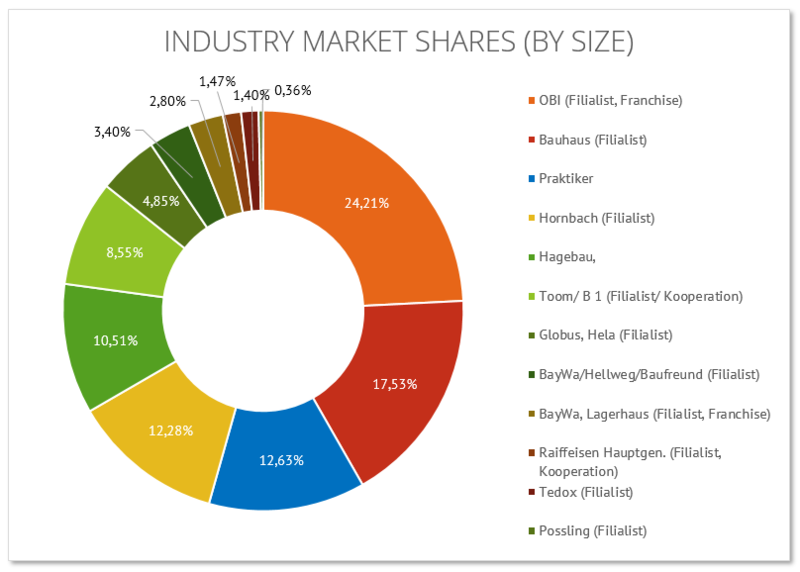 In the next chart you can see that OBI is the biggest player in the market with 24,2% of sales followed by Bauhaus 17,5%, Hornbach 12,3%, Praktiker 12%, Hagebau 10,5% and Globus 6%. Another interesting fact is that Praktiker lost over 9% of its market shares in only 5 years. (The sales numbers are out of a couple of sector magazines and annual reports, Hornbach itself says that they have a market share of about 10%, due to the fact, that they take also some companies into account, which are not clearly in the DIY industry). Furthermore you can find some regional brands. The Herfindahl Index for the DIY Industry is 1697 which lies closely to the level of the competition in the market of breakfast cereals which is indicating an intensive rivalry. The Herfindahl – Hirschman Index is a concentration ratio which is used to measure the number and relative power of the companies of an industry. This ratio is usually lower in the industries with several firms of similar size, and a high profit level. But Hornbach has a clear advantage over the other DIY operators: it has with 2205 Euro the highest sales per m² which is nearly twice as high as the comparable sales of Praktiker and 1/3 more sales per m² than OBI which sold only 1520 Euro per m². Some of the OBI stores are run under a franchise agreement, which lead to the fact that the franchise holder can easily change their store to another supplier. We think that costumers spend more on durable goods (carpets, furniture..) and less on arts, coins or antiques. The increase in the new building permits which we have seen over the last 4 years will continue until the ECB increases the interest rate significantly. Furthermore consumers spend more time at home which also leads to a stronger trend in the DIY Industry. Permanent low price policy, which is the key of Hornbach’s success is the best strategy due to the saturation of the market. The DIY sector is expected to have only slight growth opportunities. We think that OBI, which is the market leader, will continue to stay the market leader. The analysis of the market clearly shows that the high competition is due to the great number of key competitors. Simultaneously, Praktiker AG suffered significant losses of market share and a decrease in profitability due to the inefficient high pricing of its products. This ultimately led to the company’s bankruptcy in 2013. Leading out of this situation is the core question of how the bankruptcy of one of Hornbach’s greatest competitors is going to affect its equity value. The Hornbach Group is founded in the year 1877 and is since its founding days in the hand of the founding family. Today the fifth generation of the family is in charge of the business and the company was the first company who opened a Do-It-Yourself Store in Germany and the first company in Europe which opened a DIY Store with a connected gardening center. Today the company has the biggest stores, which have an average size of 11.000 m² and the highest space productivity of all German DIY Stores. Hornbach has a revenues of 3.020.000.000 Euro and 138 Stores (92 Stores in Germany) in the fiscal year of 2013. 42,4% of the revenue is generated outside Germany in Countries like the Netherlands, Swiss, Slovakia and Rumania. Today the company employs 14.000 people in 9 countries. Since the December of the year 2010 Hornbach is operating an online retailing store to sell their products. Hornbach Baumarkt AG has 31,8 Mio. outstanding shares, 76,4% of these shares are held by the Hornbach Holding AG and 5,2% are in the Hand of Kingfisher a big DIY retailer in the UK, 18,4% of the outstanding shares are in the free float. If you take a look into the annual reports and only read the statement to the shareholder which are written by the CEO you can clearly see how good and with which long-term perspective this company is managed. They invest heavily into the long term opportunities like the online store of the company and into new stores with an attractive position. The business is the business of a retailer, with the few exceptions of the size of the goods, the size and location of the store. DIY stores are mostly located on the green hayfields in the “baconbelt” of bigger cities. Interestingly this is more a pull concept than a push concept of costumer acquire customers because at the start there are mostly no other stores at this location, but after a short time other outfitters follow the DIY stores. Sometimes it occurs that two DIY stores lie close to another, these occurs mostly with a plain, aggressive DIY like Praktiker next to an higher price more on family needs orientated DIY, like OBI. The retailing business is the sale of goods and services from businesses to the end-user. A retailer purchases goods or products in large quantities from manufacturers directly or through a wholesale, and then sells smaller quantities to the consumer for a profit, therefore Hornbach matches supply and demand of durable goods. Hornbach itself defines their stores as specialty stores in which the focus lies on the project client. The focus of Hornbach lies on customer service (If you go into a store the sales associate normally greet the customer and make themself available to help the customer find whatever he needs) and everyday low prices guarantee (If you found the product somewhere else cheaper you get a payback on your price). Does Hornbach have a moat? At the first glance, a clear NO. The industry is so competitive and therefore the margins are so low that you can’t speak of a MOAT. But Hornbach remembers me of a conversation which I had with a wise man over the phenomena of DM (a famous grocery store in Germany). The man (let’s call him M) explained to me his Measurement of a Moat, the M score. The M score reaches from 0 to 10 whereas 10 is a company like Coca Cola and 0 is more like a simple trucking/logistic company which only earns 1-2% of its assets. I said that DM has a small Moat, because you don’t switch to another grocery store after you bought one time something at DM, because of the fact that they have also a credo of everyday low prices and they tread their employee’s right, have really nice stores and the employees know every article in the store. Therefore if you one time feel this satisfaction after buying your grocery stuff you will not change your shopping destination. For me DM is a company which scores with a 6-7 on the M score. And Hornbach is for me a 6-6,5 because of the fact that they treat their employee’s right, (the employee’s at Hornbach work for a regular salary which is independent of their sales, a couple of others retailers in this industry have provision salaries). If you go to Hornbach you know that you get help if you are searching for some stuff and that you get the lowest prices. I think that Hornbach is the best executer in the field of the DIY-Industry. Hornbach has the best sales figures per m², although they have the biggest stores, with a size of over 11.000 meters in average. Furthermore Hornbach has the best profit margins in the Industry which I think will increase after the bankruptcy of Praktiker. In the next chart you can clearly see the development if the market share’s and CFROI of Hornbach and Praktiker. Whereat you have to take at Hornbach into account that they opened new markets where they’re deducted the expanse for the new markets at the profit and loss statement and therefore earn a smaller profit than that what you can see here. Yes, there are some risks out there for Hornbach, because they rely heavily on the German market. Hornbach will be affected if we will see a down turn in building activities for new houses and when the European crises comes back to the headlines of the newspapers. But we think that the biggest risk for Hornbach is an increase in the competitive landscape. We don’t think that the competitive landscape will see a big change in the future, but the entrance of King Fisher in the DIY Market of Germany is a clear warning signal that the competitiveness of the market will not continual going down after the bankruptcy of Praktiker. How much would we, after this short summary, pay for Hornbach and is the bankruptcy of Praktiker already priced into the today’s share price? Hornbach is trading around Book value, (0,98), furthermore Hornbach achieved a ROIC of 12,25%, which is significant less than in the years of 2008-2010. We hope and think that Hornbach can return its profit margins back to the old levels. Therefore we think that Hornbach is more worth than the actual share price of 27 Euro. But how much more? So let’s start with a peer group valuation. The problem with this is that the all other DIY companies are not public listened and Praktiker has for the last year ridicules high multiples and is therefore not an appropriate peer. After a long search we decide that we use a mixture of retailers to calculate the multiples for Sales, EBITDA, EBIT and Net Income for the years 2013 and 2014. The Result was a range of 23,1 to 52,38 Euro per share and a weighted average of 37,74 Euro for the year 2013 and 38,83 Euro for the year 2014 per share. Because this is only rough estimation which furthermore don’t take the bankruptcy of Praktiker into account, we decided to make a DCF valuation which take the different scenarios into account. For the DCF we first calculated the WACC for Hornbach which is at the moment 6.88%, you have to keep in mind that we have rock bottom interest rates at the moment, there for you have to assume a higher WACC in the further. Than we calculated the Present Value of Hornbach under the assumption that Praktiker is not bankrupt and still in the market, so everything stays the same with the average growth rate of Hornbach over the last five year (4%) and the average sales margin of 2,6%. The price target of our DCF is 26,02 Euro which is near at the todays share price and a very conservative calculation. After this first DCF we made another DCF which consider 3 different Scenarios. We tried to define reasonable market developments. We expect Hornbach to gain extraordinary revenues to the degree of its current market share of 12.5%. We also expect margins, revenue growth and WACC to remain constant. In a worst case scenario we wanted to reflect the possibility that Hornbach is not able to gain any additional sales. Furthermore, we also included a slight increase into the WACC as an outcome of the bankruptcy of one of the main competitors. Due to this, investors might demand a higher risk premium from this specific industry. We also assumed that revenue growth rate might decline. However, we consider this scenario as very unlikely, and therefore assign a probability of merely 10%. In the best case scenario to which we assign a probability of 40%, we assumed that Hornbach will realize a greater share of Praktiker’s past revenues than those explained by its current market share. Furthermore we modelled a slight increase of revenue growth rates due to the rising GDP as well as the increasing housing permits in Germany. Given the fact that one of Hornbach’s main competitors disappeared, we think Hornbach is also likely to decrease its WACC by facing a lower risk of competition. Praktiker’s sales strategy was strongly depended on cyclical discounts of about 20%, which put prices in the industry under pressure. With this being said, we wanted to include the abandoning of this pressure by assuming a higher profit margin for Hornbach. At the end of this calculation we have 3 different price targets, the lowest was 23,45 and the highest 50,81 Euro per share. After weighting these 3 scenarios we have an expected share price of 37,9 Euro for Hornbach. Hornbach is no Moat investment, perhaps Hornbach has a small Moat but this is not this significant, but Hornbach is clearly the best executer in an overall stiff business. Overall, we think that Hornbach is about 40% undervalued and overall an extremely stable and solid value investment with a catalyst over the increase of the sales margins back to the old levels which are nearly double es high. The high equity share and private ownership and diversification in different countries justify an investment to be preferred over indices with low risk and much smaller return. We think that Hornbach can defend their market position in local markets and turning up efficiency through the holding structure. Furthermore we think that the bankruptcy of Praktiker has a positive long-term effect on the sales margins. Depending on the stock development in the next weeks, we might extend our position. NH To keep up to date with our latest articles and investment analysis, add our rss feed to your reader: http://frenzel-herzing.com/feed/. Found you via MMIs blog. Great analysis of one of my favorit German stocks and your target value is surprisingly close to the outcome of my (mechanical) valuation model. Eine Anmerkung: Könntet ihr das Laufband oben im Post abschalten, das führt dazu dass der Text dauernd hin und hergeschoben wird. Schwer zu lesen dadurch. thank you so much for your kind words, it is exciting to get such a feedback. Because we are still relativly young, we hope that we can increase our investment skills throughout the blog and the comments from other more experienced investors. Thanks for the hint; we will try to fix that! Thanks for an interesting blog post. Just wondering why the pie chart shows Hornbach market share at 19%? The company’s annual report puts the share at a little over 9% of the whole DIY market in Germany. Also, Bauhaus isn’t in the chart. I thought they were number 2 (or 3) in Deutschland? Danke. Hey GB you are totally right, we clearly missed to include Bauhaus, but I wrote over the pie chart, that hornbach itselfs talks about 10%. We have corrected this misstake already and made some adaptations in the cases of our DCF. After some research we found out that the problem with these sales figures is that they contain some not to the DIY industrie related stores and brands, therefore we adjust the pie chart for this. Thank you very much for your comment!!! Thanks for this interesting and detailed analysis! I just want to complement the blog with one observation I made in Berlin. In Berlin the DIY company named Hellweg just opened two ore maybe three new stores (some really in the center). They have the strategy to be the market leader in some regions. At the moment they increase very strong. So the aim is to become the market leader in more and more regions. They also won many awards (e.g. the award for the best service). I just want to say, that in my opinion the market of DIY companies is a very difficult one. If I ask friends, which company they prefer, they answer: “The one which is next to me”. Therefore I think that the score of Hornbach has to be much lower. Hey, good analysis. I watch this company for a couple of years, but never made such a deep analysis. But the stocks of the holding comany look even more cheap. The holding owens 75% of the undervalued shares of the Baumarkt AG. So you can buy the Holding shares with a 10-20% Discount to bookvalue. That means you can leaver your investment, while owning the Holding. What do you think ? thanks for your comment and yes, you are right in a way. If you buy Hornbach Holding you invest in a portfolio of first class real estate, which is at cost at the balance sheet, but you also have more leverage in your investment which we (as investors) don’t like. Furthermore the price of the holding has risen much faster than the stocks of the Baumarkt AG (probably due to its higher free float) . Another positive aspect for the Holding is that it holds much of the real estate and can therefore participate when it increases the rent on it. It is up to you: you could either invest in the Baumarkt AG to a P/B of 1 with the real estate at cost at the balance sheet (and further increase in sales margins) or in a fairly priced, leveraged real estate holding which trades slightly above a P/B of 1. We think that at the moment the shares of the Baumarkt AG are a little bit cheaper. I hope I could help you a little bit with this answer. Feel free to ask more questions! How do you know that Hornbach has the best profit margins? I could not draw the same conclusion as you. you are right, OBI doesn’t publish financial reports like Hornbach does it, but you can use ebundesanzeiger. Furthermore OBI is partly a franchise business and you can go out and talk with the owners. Additionally you can use the Magazine which cover the DIY-Industry in germany, they are a great source of knowledge.